The human anatomy is rather varied. It’s probably true that, to a kangaroo, we all look the same. However, where skin and bone meet the bike seat, that just isn’t true. Whether you possess “chick bits” or the old “sausage and eggs”… chances are, you differ even from your same gender friends and riding buddies. Just take my word for it. Don't go running around asking all your friends or strangers to play "You show me yours and I'll show you mine"! I'm not going to bail you out if you do. Back on topic, each rider may differ in size down there or be significantly different in shape. Ok, hopefully that’s the rather embarrassing intro out of the way and we can make a point some time in the very near future. Let’s see. New riders to MTB, and those riders who embark on long rides, often experience some sort of saddle soreness. This can come in the form of general muscle soreness, rashes, sores, blisters, bruises, abscesses and abrasions or splits from skin rubbing on skin. In this article we’ll look at causes and possible solutions to these issues from saddles and clothing to prevention. As with any problem in life, it’s best to make sure we really do have a problem before actually trying to diagnose it. Quite often, the offending pain is focused more to the rear of our ‘saddle contact patch’. If you haven’t been on your bike much, or ever, it’s possible that your derrière, your gluteus maximus (or minimus if you very slim) is simply just not used to being shoved onto a bike saddle and expected to perform for a couple of hours. Perhaps you are being unreasonably cruel to expect your ‘sit cushion and supporting staff’ to be able to simply jump on a bike once in awhile and go out there and take a pounding from the trail without consequence? Solution? Ride more regularly. Ease into it though. Do a ride and then wait a day (or few) until it all feels good 'south of the border' again. Now go ride again. If after a week or so, there is no improvement, or at any point the ‘uprising in the badlands’ is getting worse, cease and re-evaluate. Maybe one of the following paragraphs may offer an answer to what's going on. Whether the issue resides at the ‘back of the bus’ or a bit further forward, we often jump to the obvious and blame the bike saddle. And we do this because, quite often, it is indeed the culprit. But why? Saddles come in many different designs, sizes, shapes and qualities. And, because saddle choice can be so personal, due to our individual body shapes, this is a good thing. However, it means the saddle that comes on your bike may, or may not, be well suited to you. Let’s look at a few ways our bodies may vary enough to necessitate a saddle change. Our bodies vary greatly down there, as mentioned above, and one of those ways is our ‘sit bones’. These are those two knobby bones that seem to poke straight down into the saddle when we are seated. The size and space between these bones can be quite different person to person. The rider’s gender and height both have a bearing on where these sit bones actually meet the saddle. A rider’s weight will have influence on the pressure being exerted through the skeleton via the sit bones and into the saddle as well. Yep, we are talking about the 'fun bits'! The 'uglies'. 'Sir Hardalot and the Royal Twins' for boys, and whatever girls call their own rather well sort after asset?! The point being is these things, while handy on dates and in the bathroom, can kind of be in the way out on the trails. And by “in the way” we mean, have way too much negative interaction with the bike saddle. Ok, that’s enough about our bodies and how weird they are. Move along… nothing to see here. Well, you might have something to see here, but we don't want to see it thank you very much. 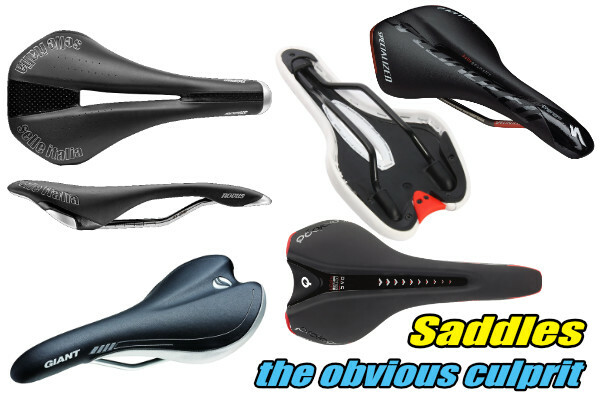 Saddles generally are designed and sold as either men's, unisex or female specific. When comparing these saddle designs, you will usually notice a female specific saddle is often a bit wider at the back where the sit bones contact than it’s male or unisex counterpart. While this is catering for the child bearing aspect of a women's body, it doesn't mean a women's specific saddle is the best choice for all women. Some designs (male, unisex or female specific) also build in subtle or very obvious channels in the saddle to allow more voluptuous body parts to be accommodated and still allow seated comfort. Gel inserts, balls or other elements are also found in some saddles to promote more softness where needed most, or enhance the ability of the saddle to mold to your body’s ‘basement’ shape. So then, taking into account your own personal design and shape of your body, you can’t always assume that the saddle you have is the best choice for you. To be fair on your saddle, it’s important that the saddle be adjusted correctly otherwise this could cause unwanted saddle soreness from the best of saddles. As we’ve mentioned in other articles, making sure your bike is correctly set up for you is vitally important. A saddle that is too far forward or back, or tilting too far up or down can also cause painful issues. Saddle height is another issue. Too high and your ‘love machine’ might be taking weight that other body parts should be sharing. Too low and again all your weight is being thrust through your ‘adult playground’ instead of being shared by your legs, feet and arms as well. Read more about setting your saddle height in our Newbies Guide To Seat Adjustment article. If your handlebars are too low or high, or too far forward or back, then your weight balance could also cause unwanted pressure on the saddle resulting in saddle soreness. Billy Connolly once said, “There’s no such thing as bad weather… just bad clothing”. He was quoting/paraphrasing another gentleman but clearly his point is that it’s no point whinging about the weather if you haven’t dressed appropriately. In cycling, there are offerings to help with saddle soreness. 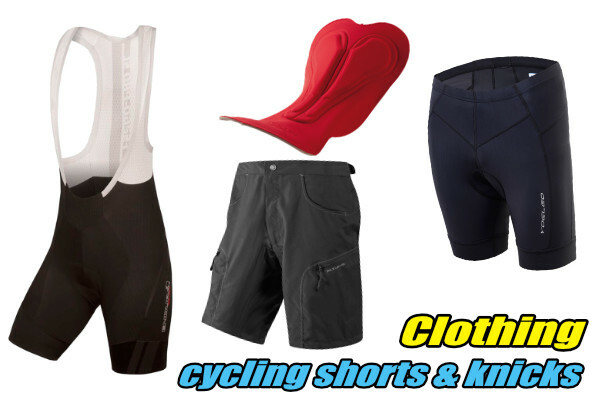 Cycling knicks and trail shorts come with built in pads, once called chamois because (when I started riding) they were made from leather and required careful maintenance. These days the synthetic replacement materials adequately replace the leather and provide a more wash and forget product. The pad/chamois has an inner foam layer to provide cushioning and shape. These products are designed to be worn without underwear. Underwear seams or folds can rub and cause abrasions or put extra pressure where it’s not wanted. Obviously there are certain times when ladies may choose to wear underwear inside their cycling knicks/shorts. During those days perhaps limit the distance you ride and use cycling anti-abrasion creams as a preventative. Back in the day of leather chamois knicks, many of us would use good old vaseline as an ointment barrier between chamois and skin. If you’ve never applied vaseline to your ‘undercarriage’ then you missed out! You missed out on a very cold, uncomfortable and gluggy experience. It did it’s job though. Today thankfully, we have some nicer choices with a bit more technology built in as well. Modern cycling creams (often still called chamois creams) often contain lots of those skin friendly substances such as cocoa butter, lanolin and beeswax. For antiseptic, anti-bacterial or anti-fungal qualities they may contain such things as oils, alcohols and other elements. They will also wash out easily, unlike petroleum based products like vaseline. Pretty sure you’ve worked out where you put this right? Yep, apply directly to the skin areas you feel need protection in the aforementioned undercarriage region. If you run out of your favourite cycling cream, or have not got one yet, I find Savlon is often in your home first kit somewhere and is a good alternative until you get a proper cycling cream sorted. Ok then, let’s just summarise. Listed different results from saddle soreness… check. Listed various ways our bodies are differently personal… check. Told you to harden the hell up before blaming your saddle… check. Discussed various saddle design elements… check. Mentioned how weird your body parts are and how the right saddle is a personal choice… check. Highlighted that bike set up is vitally important… check. Explained why proper cycling pants are helpful and how to use them… check. Talked about preventative creams and where to stick them… check. Found as many unnecessary ways as possible to describe your privates… check. Job done then. Here’s to saddle pain free riding. Hope we helped. Stop giggling... this is serious stuff!